Meet Vallejo officer David McLaughlin a trigger happy psychopath cop who has no right to be a peace officer or worse have deadly force. This monster and problem person with huge ego and attitude issues is the exact reason why police are not trusted today. 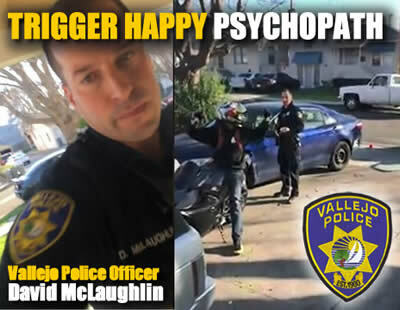 It is because Vallejo Police department keeps him employed as their poster boy of problem, abusive and immoral cops that the public loses respect and faith in the entire department. BULLY ALERT, this is a typical elementary school loser who was the school bully who found his way into law enforcement and now bullies the public with impunity. Note that this cowardly piece of garbage has a history of pulling deadly force and yet remains employed. There are several videos and stories below documenting this mentally unstable beast. He has no business being in law enforcement. In an interview, Burrell said that he was relaxing in his home at about 3:15 p.m. that day when he saw his cousin outside on his motorcycle with his hands up. Vallejo police Officer David McLaughlin was crouched behind the door of his patrol car, pointing his gun at Burrell’s cousin. Burrell stepped outside onto his home’s porch on Byron Street. He said his cousin was wearing a motorcycle helmet and couldn’t hear the officer, and walked toward McLaughlin, saying, “Hey he can’t hear you, he has his helmet on,” according to Burrell. “This is concerning I better film this,” Burrell thought. “I’m not resisting. Put me on the ground,” Burrell says.